Water temperature is a physical property expressing how hot or cold water is. As hot and cold are both arbitrary terms, temperature can further be defined as a measurement of the average thermal energy of a substance 5. Thermal energy is the kinetic energy of atoms and molecules, so temperature in turn measures the average kinetic energy of the atoms and molecules 5. This energy can be transferred between substances as the flow of heat. Heat transfer, whether from the air, sunlight, another water source or thermal pollution can change the temperature of water. Water temperature plays a major role in the quality of aquatic life and habitats. Heat flow and the fluctuation of temperature determine what species will live and thrive in a body of water. Water temperature has been defined as the “abiotic master factor” by JR Brett due to its effect on aquatic organisms 15. What does that mean for lakes, rivers and oceans? Water temperature affects nearly every other water quality parameter. The metabolic rates of aquatic organisms increase as the water temperature increases. Considered alone, water temperature can affect the metabolic rates and biological activity of aquatic organisms14. As such, it influences the chosen habitats of a variety of aquatic life 8. Some organisms, particularly aquatic plants flourish in warmer temperatures, while some fishes such as trout or salmon prefer colder streams 8. Studies have shown a direct relationship between metabolic rates and water temperature. This occurs as many cellular enzymes are more active at higher temperatures 18. For most fish, a 10°C increase in water temperature will approximately double the rate of physiological function 16. This increase in metabolic rate can be handled by some species better than others. Increased metabolic function can be noticed in respiration rates and digestive responses in most species. Increased respiration rates at higher temperatures lead to increased oxygen consumption, which can be detrimental if rates remain raised for an extended period of time. Furthermore, temperatures above 35°C can begin to denature, or breakdown, enzymes, reducing metabolic function 18. Temperature fluctuations can also affect the behavior choices of aquatic organisms, such as moving to warmer or cooler water after feeding, predator-prey responses and resting or migrating routines 16. Some species of sharks and stingrays will even seek out warmer waters when pregnant 16. 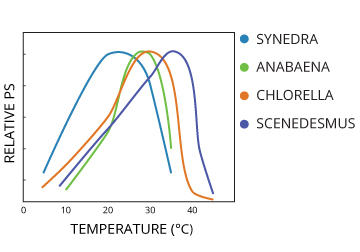 Temperature affects the photosynthetic rates of different algae. Plants are also affected by water temperature. While some aquatic plants tolerate cooler waters, most prefer warmer temperatures 17. Tropical plants in particular will show restricted growth and dormancy in water temperatures below 21°C 17. While dormancy is appropriate for surviving a cold winter, warmer temperatures are required for most plants to flourish. Temperature can also inhibit plant respiration and photosynthesis 14. In general, algal photosynthesis will increase with temperature, though different species will have different peak temperatures for optimum photosynthetic activity 14. Above and below this temperature, photosynthesis will be reduced. 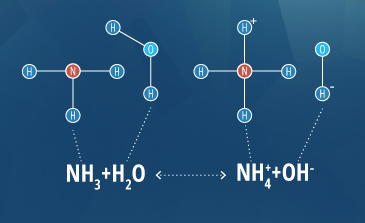 Water temperature can play a role in the shift between ammonium and ammonia in water. In addition to its effects on aquatic organisms, high water temperatures can increase the solubility and thus toxicity of certain compounds 1. These elements include heavy metals such as cadmium, zinc and lead as well as compounds like ammonia 19,20. Water temperature can not only increase the solubility of toxic compounds, but it can also influence an organism’s tolerance limit 19. Mortality rates for zinc are significantly higher at temperatures above 25°C than at temperatures below 20°C 19. This occurs because tissue permeability, metabolic rate and oxygen consumption all increase with increased water temperature 19. In one study on labeo bata fish, the 24 hour 50% lethal concentration (LC50) at 15°C was 540 mg/L, while at 30°C, the LC50 dropped to 210 mg/L 19. Dissolved oxygen concentrations are dependent on temperature. The warmer the water, the less oxygen that it can hold. However, for every 10°C increase in temperature, the ratio of unionized ammonia to ammonium doubles 21. In 2013, the EPA determined that the criterion maximum concentration for freshwater species is 17 mg/L Total-Ammonia-Nitrogen (including both NH3 and NH4+) due to its potential jump in toxicity at a higher pH and temperature 21. The solubility of oxygen and other gases will decrease as temperature increases 9. This means that colder lakes and streams can hold more dissolved oxygen than warmer waters. 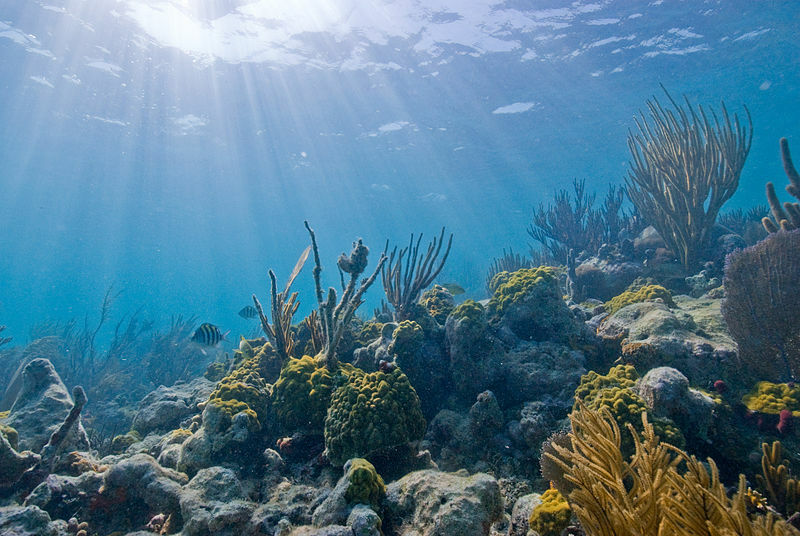 If water is too warm, it will not hold enough oxygen for aquatic organisms to survive. Water temperature can affect conductivity in two ways. As conductivity is measured by the electrical potential of ions in solution, it is affected by the concentration, charge and mobility of those ions 11. Water temperature affects viscosity, which in turn affects ionic activity and conductivity. 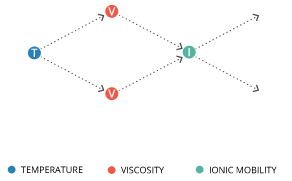 Ionic mobility is dependent on viscosity, which is in turn dependent on temperature 13. Viscosity refers to a liquid’s ability to resist flow 23. The more viscous it is, the less fluid it is; molasses and mercury are more viscous than water. The inverse relationship between temperature and viscosity means that an increase in temperature will decrease viscosity 14. A decrease in the viscosity of water increases the mobility of ions in water. As such, an increase in temperature thus increases conductivity 11. Conductivity increases approximately 2-3% per 1°C increase in temperature, though in pure water it will increase approximately 5% per 1°C 11. This variation is why many professionals use a standardized comparison of conductivity, known as specific conductance, that is temperature corrected to 25°C 10. Many salts are more soluble at higher temperatures. The second way that temperature can affect conductivity is through ionic concentration. Many salts are more soluble at higher temperatures 22. As a salt dissolves, it breaks down into its respective ions. As warm water can dissolve several minerals and salts more easily than cold water, the ionic concentration is often higher 9. The increased mineral and ion content can be noticed in natural hot springs, which tout their “healing” abilities 50. 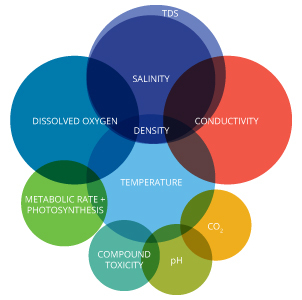 These dissolved solutes are often referred to as Total Dissolved Solids, or TDS 12. TDS refers to all ion particles in solution that are smaller than 2 microns 24. These salts and minerals enter the water from rocks and sediment in contact with it. As they dissolve and the ionic concentration increases, so will the conductivity of water. The rate at which conductivity increases is dependent on the salts present in solution 22. 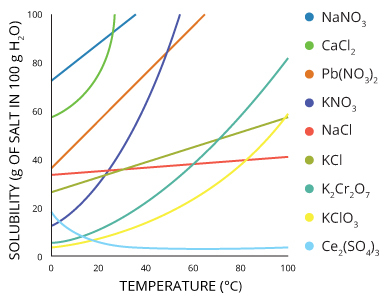 The solubility of KCl will increase from 28g KCl/ 100g H2O at 0°C to 56 g KCl/ 100g H20 at 100°C, while the solubility of NaCl only increases from 35.6g to 38.9g NaCl/100g H20 over the same temperature range. In addition, there are a few salts that become less soluble at warmer temperatures, and thus will negatively affect conductivity 22. 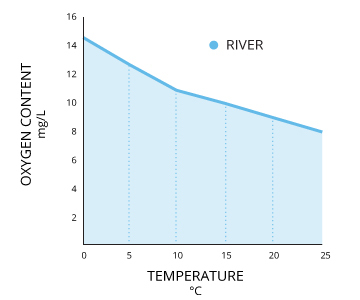 Water temperature affects ORP, but to what extent is difficult to define in the field. The redoxing species in calibration solutions are quantitatively known, and thus temperature’s effect can be measured. 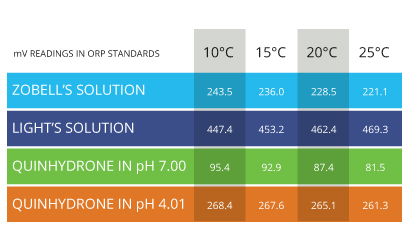 Oxidation Reduction Potential, known as ORP, is also temperature dependent. The effect that temperature has on ORP values depends on the chemical species (atoms, molecules and ions) present in the solution 25. Temperature-dependence data charts are usually available for calibration solutions, but not for field samples 25. This lack of data is due to the difficulty in identifying and measuring every redoxing species that could be present in any given water source. As these species are difficult to know and quantitatively define in environmental studies, most ORP electrodes will not automatically compensate for temperature. However, temperature can still alter a reading and should be recorded with each measurement considered when analyzing the data 26. Water temperature can alter the number ions present, changing the pH of the solution without making it more acidic or basic. pH is calculated by the number of hydrogen ions in solution. At a pH of 7, the hydrogen and hydroxyl ions have equal concentrations, 1 x 10-7 M, keeping the solution neutral 27. However, these concentrations only hold true at 25°C. As the temperature increases or decreases, the ion concentrations will also shift, thus shifting the pH value 27. This response is explained by Le Chatelier’s Principle. Any change to a system at equilibrium, such as adding a reactant or altering the temperature, will shift the system until it reaches equilibrium again 28.
is an exothermic reaction 28. That means if the temperature of water increases, the equation will shift to the left to reach equilibrium again. A shift to the left decreases the ions in water, increasing the pH. Likewise, if the temperature were to decrease, the equation would shift to the right, increasing the ionic concentration and decreasing pH. The pH of pure water varies with temperature while remaining perfectly neutral. Pure water only has a pH of 7.0 at 25 degrees Celsius. However, that does not mean that temperature changes will make a solution more acidic or basic. Because the ratio of hydrogen and hydroxyl ions remains the same, the acidity of water does not change with temperature 28. Instead, the entire pH range shifts, so that neutral water will have a value other than 7. 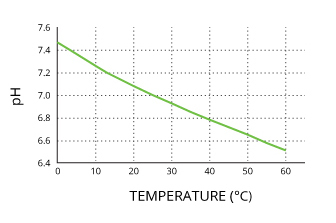 Pure water will remain neutral at 0°C (pH is 7.47), 25°C. (pH is 7.00) or 100°C. (pH is 6.14). Water temperature and water density are directly related. As the temperature of water increases or decreases, it will alter the density of water. This is a unique relationship in that unlike most materials, the density of pure water decreases approximately 9% when it freezes 29. This is why ice expands and floats on water. 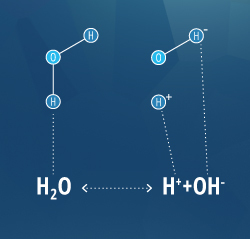 Pure water is also unique in that it achieves its maximum density, 1.00 g/ml, at 4°C 29. Water at temperatures above and below this, including superheated and supercooled water, will float on 4°C water. Water is most dense at 4 degrees Celsius, and least dense in its solid form as ice. The maximum density point is particularly important in freshwater. If water was most dense at its freezing point (0 °C) then it would sink to the bottom, freezing a body of water from the bottom up, killing all of the organisms living within it 29. Instead, this property ensures that the bottom of a body of water will remain at least 4°C, and thus unfrozen 30. 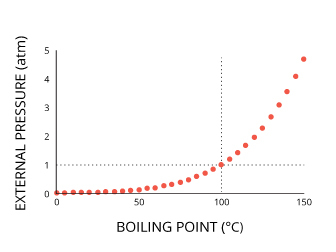 The temperature/density relationship thus creates a water convection pattern as it cools. As surface water temperature approaches the maximum density temperature, it sinks and is replaced by warmer, lighter water 42. This process continues until the water is uniformly cool. Any water that is colder than this point will float on top of the denser water. This convection pattern allows water both warmer and colder than 4°C (and at potentially different dissolved oxygen concentrations) to intermix 30. This process occurs seasonally in holomictic (mixing) lakes, as the water temperature (and thus other parameters) reach equilibrium 14. 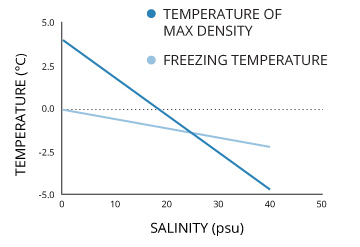 Freezing point and maximum density decrease as salinity levels increase. It is important to note that salinity not only affects water density but it can shift the maximum density and freezing points of water. As the salt concentration increases, both maximum density and the freezing point will decrease 14. Average seawater has a salinity level of 35 PPT (parts per thousand) and has a shifted maximum density of -3.5°C 14. This is more than a 7° difference from freshwater and is below seawater’s freezing point of 1.9°C 14. However, this maximum density is never reached 39. Instead, the process on convection simply circulates the cooling water until the entire surface water column reaches the freezing point 42. As the phase boundary between liquid and solid requires the proper pressure as well as temperature, ice only beings to form on the surface 30. The coldest recorded natural seawater temperature was -2.6°C, recorded beneath an Antarctic glacier 38. Likewise, the coldest ocean currents recorded were -2.2°C at a depth of 500 m. In both cases, hydrostatic pressures allowed water to remain liquid at such cold temperatures 38. Ice floats on top of the denser water. 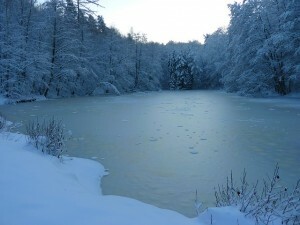 It is common knowledge that freshwater begins to freeze at 0°C. Salt water, however, has a lower freezing point. That is why salt is used in winter to de-ice roads and sidewalks. Average seawater has a salinity level of 35 PPT (parts per thousand), which shifts the freezing point to -1.9°C 14. The density of pure water ice at 0°C is 0.9168 g/ml, nearly 9% lighter than liquid water at 0°C, which has a density of 0.99987 g/ml 14. That does not sound like a large difference, but it is enough to keep ice floating on top of water and allows aquatic organisms to survive the winter. This drop in density occurs because the hydrogen bonds in water create an open hexagonal lattice, leaving space between the molecules 42. Ice formed in seawater is even less dense than freshwater ice 40. When saltwater begins to freeze, the water molecules begin to form a crystal lattice (just like they do in freshwater). These crystals only include water molecules, not salt ions, and the formation is known as brine exclusion 43. As the ice structure grows, pockets of concentrated saltwater can be trapped inside the ice, but are not incorporated into its structure. The trapped water can eventually drain, leaving a small air bubble in the ice. 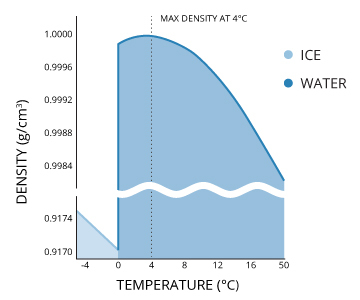 The air bubbles left behind reduce ice density significantly – down to 0.8-0.9 g/ml 40. 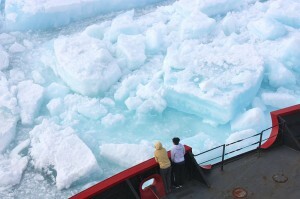 New sea ice can taste salty due to the trapped brine that has not yet escaped. Older ice structures, called multiyear ice, have no brine left and are fresh enough to drink once melted 41. The temperature/density relationship also contributes to stratification. Thermal image of Ice Lake’s stratification over a 22 month period. The lake mixes every spring and fall, realigning the temperature throughout the lake. The thermocline exists at different depths depending on the season. Stratification is the division of a water column into strata, or layers, of water with different properties. These divisions are usually defined by temperature and density, though other parameters such as salinity and chemical distinctions can also be used 31. Stratification occurs because work (force and displacement) is required to mix liquids of different densities 14. Thermal stratification is usually seasonal, with clear delineations between layers during the summer, narrower layers in winter, and a “turnover” in the spring and fall when temperature is fairly uniform throughout the water column 32. As seasons progress, sunlight, wind, ambient temperature and ice (in winter) cause the lake to restratify 32. When referring to temperature and density strata within a lake, the layers are usually called the epilimnion, metalimnion and hypolimnion from top to bottom 14. The upper layer, the epilimnion, is exposed to solar radiation and thermal contact with the atmosphere, keeping it warmer. The epilimnion will extend as far as sunlight and wind will allow, and is usually deeper in lakes with greater surface areas 14. Lake stratification – the different layers are separated by thermoclines, or temperature gradients. Below the epilimnion is a layer of water with a rapidly changing temperature range known as the metalimnion 32. The metalimnion serves as the boundary between the upper and lower layers of water. The temperature in this strata can vary greatly between its top and bottom depths 14. In addition, the metalimnion can fluctuate in thickness and depth due to weather conditions and seasonal changes 14. 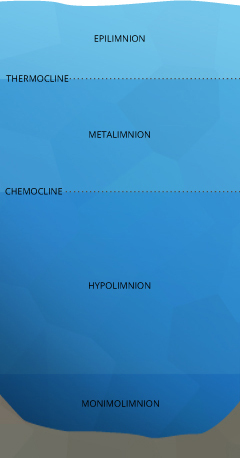 The metalimnion is bordered on both top and bottom by an edge called the thermocline. The thermocline is defined as the plane of maximum temperature decrease 14. In other words, when the water temperature begins to significantly drop, the thermocline has been crossed. This plane is generally accepted as the depth at which temperature decreases at a rate greater than 1°C per meter 14. As temperature and density are related, a second cline, known as a pycnocline exists at the same depths. The pycnocline divides water column strata by density 33. Below the second thermocline and pycnocline is the hypolimnion. This strata is usually too deep to be affected by wind, solar radiation and atmospheric heat exchanges 31. The temperature of the hypolimnion is usually determined by the spring turnover. In deeper lakes, the mixing can be minimal and the hypolimnion will remain near maximum density, or 4°C 14. Shallower lakes may be able to raise the temperature of the hypolimnion to over 10°C. This temperature may only change minimally, if at all, while stratified 14. A flowchart of Hutchinson and Loffler’s classification of lakes based on stratification and circulation patterns. Lakes that do not mix completely are called meromictic lakes 14. These lakes have a lower strata that remains isolated throughout the year. This bottom layer is known as the monimolimnion, and is usually divided from the collective layers above it (mixolimnion) by a halocline (salinity-based cline)31. Meromictic conditions can occur in a holomictic lake when unusual weather conditions cause the lake to stratify before it has time to completely mix 14. Pressure does not directly alter water temperature. Instead, it shifts the freezing, boiling and maximum density points. The temperature at which boiling and freezing occur will only hold true at sea level 3. Pressure can change the boiling point of water. As warned in some recipes, cooking times are longer at higher elevations, due to a shift in water’s boiling point. This is due to the effect of atmospheric pressure. At a lower pressure (higher altitude), water will boil at a lower temperature. On the other side of the scale, at higher pressures (such as in a pressure cooker), water will boil at a higher temperature 34. Atmospheric pressure does not affect the temperature of the water itself, but only its ability to become vapor, thus shifting the boiling to the left or right. Pressure also explains why ice only forms at the water’s surface. As the hydrostatic pressure increases, the freezing point lowers 30. At high elevations (lower pressure), there is a slight increase in the freezing point, but the change in pressure is not enough to significantly affect the point 30. What Factors Influence Water Temperature? Water temperature can be affected by many ambient conditions. These elements include sunlight/solar radiation, heat transfer from the atmosphere, stream confluence and turbidity. Shallow and surface waters are more easily influenced by these factors than deep water 37. Solar radiation is the greatest influence on water temperature. The greatest source of heat transfer to water temperature is from sunlight 36. Sunlight, or solar radiation, is a form of thermal energy 45. This energy is then transferred to a water’s surface as heat, increasing the temperature of the water. This heat transfer is due to water’s relatively low albedo 44. Albedo is the determined quality of a surface’s ability to reflect or absorb sunlight. Water’s low albedo means that it absorbs more energy than it reflects 44. The result is a daily fluctuation in water temperature based on the amount of sunlight received by the water. If a body of water is deep enough to stratify, sunlight will only transfer heat through the photic zone (light-reaching). Most of this energy (greater than half) is absorbed in the first 2 m of the water 14. This energy will continue to be absorbed exponentially until the light is gone. The photic zone varies in depth but can be up to 200 m deep in the oceans46. The depth of the photic zone is based on the amount of solids and other light-scattering elements present in the water. The temperature of water below the photic zone is generally only altered when the water is mixed 37. Thus shallower bodies of water tend to warm quicker and reach higher temperatures than deeper water bodies 1. Atmospheric heat transfer occurs at the water’s surface. As heat always flows from a higher temperature to a lower temperature, this transfer can go both ways 6. When the air is cold, warm water will transfer energy to the air and cool off. 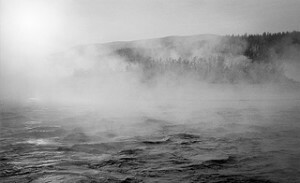 This conduction can often be seen as fog or a “steaming” river 14. If the air is hot, cold water will receive the energy and warm up. The extent of this transfer is based on the thermal inertia and specific heat of water 14. Water temperature fluctuations are more gradual than air temperature fluctuations 14. 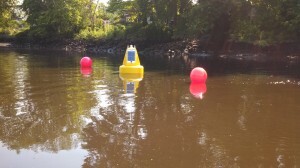 Turbidity monitoring during the Passaic river dredge project. Turbidity can increase water temperatures. Increased turbidity will also increase water temperature. Turbidity is the amount of suspended solids in water. These suspended particles absorb heat from solar radiation more efficiently than water 47. The heat is then transferred from the particles to water molecules, increasing the temperature of the surrounding water 47. Groundwater, streams and rivers can alter the temperature of the body of water into which they flow. If a spring or groundwater source is colder than the river it flows into, the river will become cooler. Recalling the rules of heat transfer (energy flows from hot to cold), the river loses energy to the cooler water as it warms it up 6. If the inflow is large or fast enough, the equilibrium temperature of the water will be close to the temperature of the inflow 1. 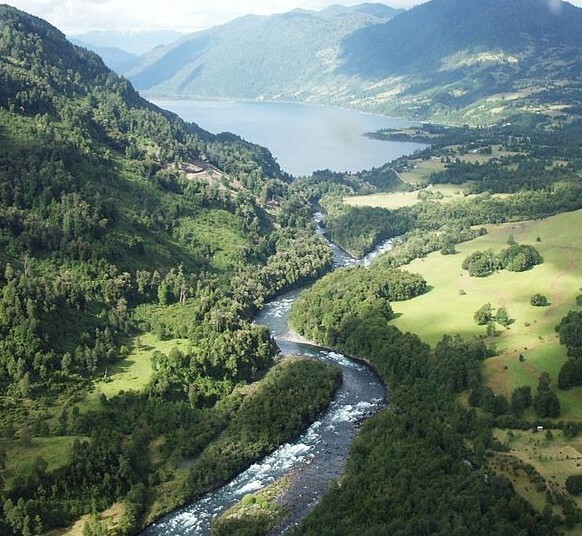 Glacial fed streams will keep conjoining rivers cooler near the source of the flow than further downstream 1. Man-made influences on water temperature include thermal pollution, runoff, deforestation and impoundments. Thermal pollution is any discharge that will dramatically alter the temperature of a natural water source 48. This pollution commonly comes from municipal or industrial effluents 1. If the temperature of discharge is significantly warmer than the natural water, it can negatively affect water quality. 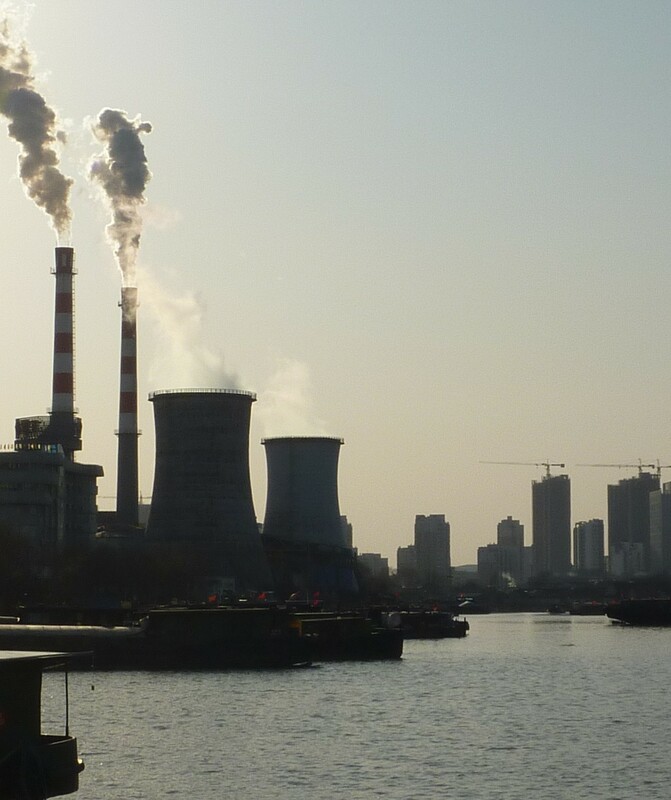 There are several significant consequences of thermal pollution, including diminished dissolved oxygen levels, fish kills and influxes of invasive species 48. Runoff from parking lots and other impervious surfaces are another form of thermal pollution. Water that flows off of these surfaces absorb much of their heat and transfer it to a nearby stream or river, elevating the temperature 9. It is not only manmade additions that can affect water temperature. Water that is shaded by vegetation and other objects will not absorb as much heat as sunlit water 14. When trees or riparian canopies are removed, a body of water can become unusually warm, altering its natural cycle and habitats 48. 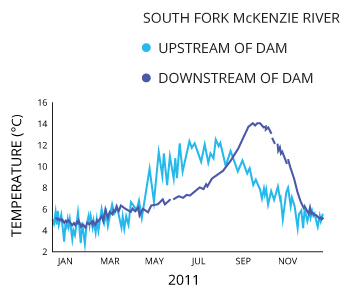 The McKenzie dam altered the water temperature pattern downstream, affecting fish behaviors, particularly reproduction. Impoundments such as dams can drastically affect water temperature cycles. While a dam does not directly contribute heat to the water, it can affect the natural patterns of water temperature warming and cooling 9. An operational dam without a sliding gate assembly can alter the water temperatures downstream of the dam, which can affect local fish population behaviors. Shifting the temperature pattern can affect the migration, spawning and hatching of local fish species 9. The temperature pattern will shift if the reservoir stratifies and the dam release is too high or too low, releasing unusually cool or unusually warm water into the stream 9. Seasonal temperature fluctuations across the US. Water temperature can vary from frozen ice to near boiling, so what determines a “typical” temperature? Typical temperatures are dependent on 1) type of water body 2) depth 3) season 4) latitude 5) surrounding environment. While a specific body of water can have a general pattern that it follows annually, there is no definitive “typical” temperature for water. Even a specific body of water can vary due to any of these sources; a lake might freeze over one winter, but it might not freeze the following year due to a warm winter. It follows the same warming cooling pattern both years, but it does not reach the same temperatures. Any “unusual” temperatures must be taken in context. Rivers and streams tend to experience greater, more rapid and temperature fluctuations than lakes and oceans 14. Likewise broad, shallow lakes will be warmer than their deeper counterparts. Due to the shifting angle of solar radiation and the effects of atmospheric heat transfer, water temperatures will vary seasonally 44. As solar radiation is more intense near the equator, water at lower latitudes wills to be warmer than water at higher latitudes 44. Shaded streams will not be as influenced by solar radiation as their exposed counterparts and can remain cooler. Bodies of water that are influenced by groundwater flow or a glacial fed stream will also be cooler 1. Oceanic temperatures also vary by season, latitude, depth, ocean currents and convection 51. Surface water will vary more with season and latitude than deeper waters, and show diurnal (daily) fluctuations due to solar radiation and wind 53. This diurnal variation can be as great as 6 degrees Celsius 53. Due to its massive size and the high specific heat of water, the ocean has an equally large heat capacity 14. This means that fluctuations between seasons or due to unusual events will only have a slight impact 51. Studies have shown the ocean has warmed approximately 0.1 degrees Celsius in the past century 52. While this number seems small, it is quite considerable in regards to the size of the ocean. The temperature of the ocean plays an important role in atmospheric conditions across the globe. Hurricanes, cyclones, thunderstorms and other weather events can form depending on the temperature of the ocean 53. Monsoons can occur when there is a large temperature differential between land and sea, causing cyclical precipitation and storms 35. Hurricanes and cyclones develop over warm water, where the heat can be rapidly transferred to the air via convection 54. In a similar vein, lake-effect snow and other heavy precipitation conditions can form when cold air flows over a large, warmer body of water 55. The ocean also interacts with the atmosphere to create El Niño and La Niña events. El Niño describes the warming of the Pacific Ocean due to a lack of wind, which alters the depth of the thermocline. This warming in turn affects weather and temperature patterns across the globe 35. La Niña is the opposite condition of the ocean, where temperatures are cooler than normal, typically with reverse impacts on the weather 35. These events are irregular, occurring ever 2-7 years. They can last anywhere from 9 months to a couple years, depending on the strength of the episode 35. There are some bodies of water with unique temperature levels. 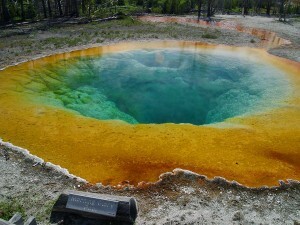 The most commonly known examples are hot springs. Hot springs, also known as hydrothermal springs, are fed by groundwater that is significantly warmer than other flows 50. These unique waters are warmed by geothermal heat. This heat transfer can come from groundwater flows that run deep enough into the Earth’s crust, or that come into contact with magma in volcanic zones 50. Hot springs remain much warmer than the ambient ground temperature, with some volcanic hot springs even reaching boiling temperatures 50. Other unique water bodies are heliothermic lakes. These lakes are usually saline, meromictic lakes, which means that when they stratify, only the upper layer of the water will mix 14. As discussed in the stratification section, the layers are separated by a halocline, with the mixolimnion remaining fairly fresh and the lower monimolimnion containing a higher salt concentration 14. When this stratification falls within the photic zone, unusual events happen. Sunlight that reaches the monimolimnion heats the water. This heat cannot escape because the density of the saline lower layer is not significantly affected by increasing temperatures 14. The result is a heat trap at the halocline, where temperatures can easily reach 50°C and higher 14. 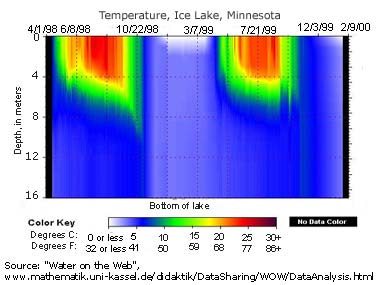 Hot Lake in Washington is one example of a heliothermic lake, where the halocline remains near 30°C even when the lake is covered in ice 14. 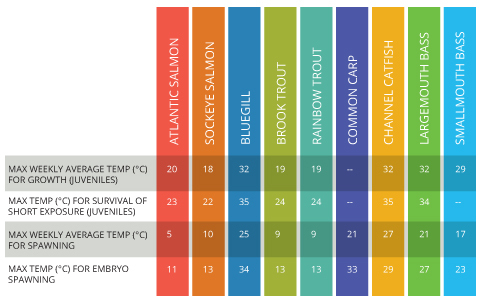 Maximum recommended temperature levels for different fish species at various lifetime stages. Water that is too warm is usually considered to be more dangerous to aquatic life than cold water. However, both can affect growth, disease tolerance and survival rate 8. Water that is too cold will affect the biological processes and metabolic rates of aquatic organisms 14. 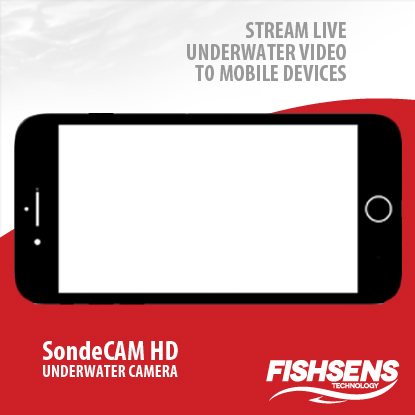 On the other side of the scale, water that is too warm can cause excessive respiration rates, stressing fish. Warm water also cannot hold as much dissolved oxygen as cold water, so there is less oxygen available for uptake by organisms 14. Each fish species has its own comfort range. Temperatures outside of this range can be detrimental to growth and survival. Salmon and trout prefer to swim in colder rivers, while largemouth and smallmouth bass can tolerate much warmer waters for both growth and spawning 8. So how does one determine water quality with temperature? The EPA and some states, including Alaska, Idaho, Oregon and Washington, have recommended maximum seasonal and regional temperatures49. Other states offer no numerical value, and instead state “no measurable change from natural conditions”1. This puts a strong priority on thorough and long-term monitoring. The more historical data that is available, the more abnormal fluctuations can be detected and addressed. If a lake that normally stratifies year after year around 20°C and 8°C in the epilimnion and hypolimnion begins reading 23°C and 17°C respectively, it may be becoming eutrophic (nutrient heavy, often hypoxic) due to agricultural runoff1. Water temperature’s impact on a variety of other parameters make it a subtle, but vital, factor in determining water quality. The most common temperature scales: Fahrenheit, Celsius and Kelvin. 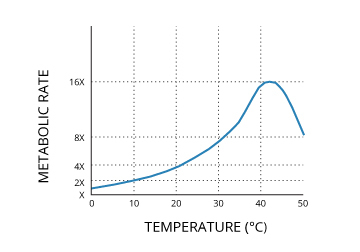 As temperature measures thermal energy, scales have been developed to give temperature values meaning relative to other values. 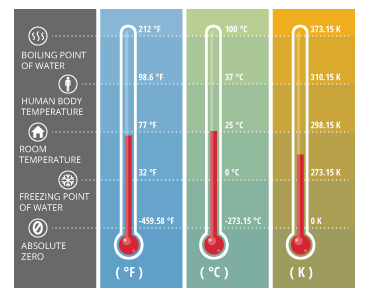 Today, water temperature is commonly measured on one of three scales: Celsius, Fahrenheit or Kelvin 2. When using the Celsius or Fahrenheit scales, temperature is measured in degrees. On the Kelvin scale, the unit is a kelvin, but it is the same magnitude as a Celsius degree 2. Due to its universal use, water temperature is generally reported on the Celsius scale 1. The Fahrenheit and Celsius scales are defined by the degrees at which water freezes and boils 3. The Celsius scale is also referred to as centigrade because there is a 100 degree interval between the two defined points (freezing and boiling of water) 2. The Kelvin scale is based on the theoretical point of absolute zero 2. 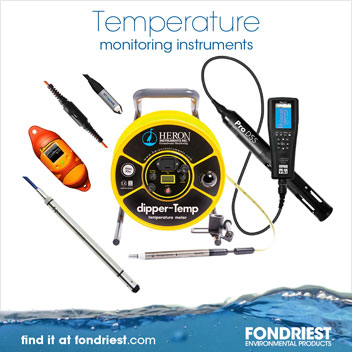 Fondriest Environmental, Inc. “Water Temperature.” Fundamentals of Environmental Measurements. 7 Feb. 2014. Web. < https://www.fondriest.com/environmental-measurements/parameters/water-quality/water-temperature/ >.